Illinois educators looking to bring a new level of excitement for STEM –– science, technology, engineering and math –– to their schools in the new year can get a helping hand from the seasoned pros at NIU’s Center for P-20 Engagement. Our experienced STEM educators are available to come to your school and stage dazzling hands-on demonstrations that grab students’ attention with exciting phenomena like liquid nitrogen, lasers and lightning bolts. Alternately, students can make the trip to NIU’s DeKalb campus and benefit from our campus experts, laboratories and observatories. A list of standard options (with pricing information) is available online. Once you contact STEM Outreach, they work with you to customize these offerings for each group’s particular needs. Convenient in-class options are available for a variety of age groups. For younger classrooms –– kindergarten through second grade –– we offer “It’s Not Magic, It’s Science,” a program of approximately 45-minutes designed to capture students’ imaginations with eye-popping demonstrations. Kids learn how to ask critical questions and unlock the scientific principles behind levitating balls, invisible test tubes and shrinking balloons. 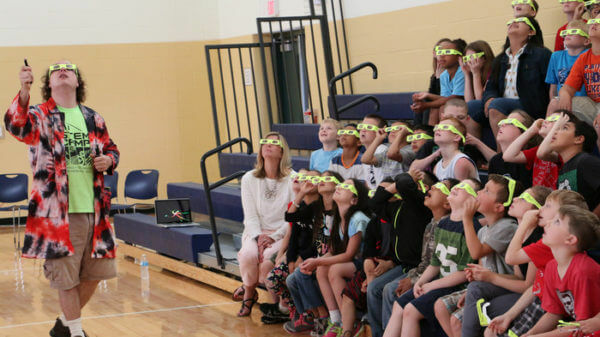 For students in third grade through eighth, our “Frontier Science Road Show” offers a variety of demonstration programs that delve deeper into STEM subjects. Teachers can align the demonstrations to their curriculum by picking from a broad menu of topics, including “light and lasers,” “acoustics and sound,” “electricity and magnetism,” and more. These demonstrations can be offered to a single classroom –– or expanded to captivate an entire auditorium. When the goal is maximizing hands-on engagement, the clear answer is the STEM Exploration Lab. NIU’s STEM educators come to your school and set up an array of interactive demonstrations and hands-on activities that illuminate STEM concepts. Like our classroom demonstrations, Exploration Labs can be customized for any setting, from individual classroom visits to evening or weekend open-house days open to families. The STEM Outreach office can also arrange for NIU STEM faculty to visit classrooms to give talks on their current research and STEM career paths. Alternately, campus visits are available as well. To give your students a glimpse of how STEM experts explore their fields at a major university, book a day trip to the NIU campus. With an astronomical observatory, a planetarium, a wide array of subject experts and dozens of laboratories, we can customize a day program to meet any group’s needs. To learn more, visit NIUs STEM Outreach or contact STEMOutreach@niu.edu.